The Hozelock Assembled Reel has a small internal drum diameter and an extra-long winding handle, rewinding is easy. This hose reel has a robust metal towing handle, oversized soft patterned wheels and steel axle, which makes moving the hose reel easy. 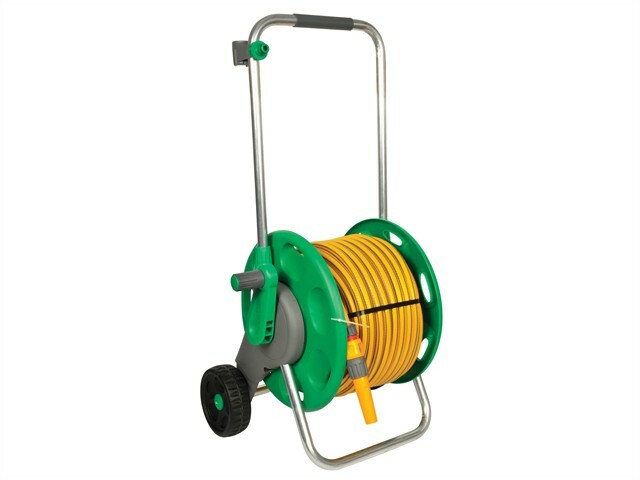 This Assembled Hose Reel has a wide stance and low centre of gravity to make it very stable. The towing handle collars allow the height to be adjusted to suit any needs and also allows full retraction to store in a shed or garage. Fixed durable towing handle to make towing easy, extra wide for stability and has been designed so the hose is easy to rewind. Made from the highest quality plastics, will stand the hard wearing challenge of gardening tasks, time after time. Designed and made in Great Britain, the Hozelock 60m capacity Assembled Hose Reel extends Hozelock’s heritage of quality, innovative products that are designed for gardeners by gardeners. Supplied with 12.5mm Braided Starter Hose, 1 x Nozzle, 2 x Hose End Connectors, 1 x Aquastop and 1 x Tap Connector.